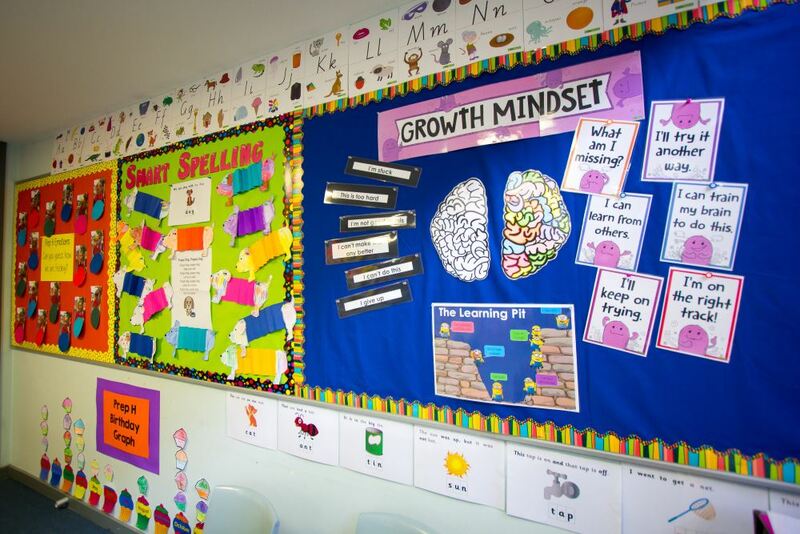 At Lysterfield Primary School, we use the Theories of Action of Curiosity and Powerful Learning to deliver a rigorous and consistent curriculum. These include Consistent Teaching and Learning Protocols, Harness Learning Intentions, Narrative, & Pace, High Expectations & Authentic Relationships, emphasise Inquiry Focused Teaching, Set Challenging Learning Tasks, Frame Higher Order Questions, Connect Feedback to Data, Commit to Assessment for Learning and Implement Cooperative Groups. This framework supports our students’ curiosity, enriches their learning skills and promotes their spirit of inquiry. Through this framework, we have developed school-wide approaches to instructional practices in English and Mathematics. Our teachers plan, resource, deliver & evaluate their programs as a team. This eliminates variation from classrooms and ensures all students have equal access to the same learning experiences and opportunities. Through this team approach, students are known by more than one teacher, therefore more than one teacher is supporting their success at school. At Lysterfield PS we have a whole school approach to classroom management. All teachers create positive and secure learning environments, which promote a growth mindset and allow curiosity to flourish. Research shows that students with a growth mindset are more interested in learning, more eager to take on challenges, and more academically successful. LPS students are supported in developing a growth mindset to ensure they will ask more questions, seek out challenges that allow them to learn something new, put in the extra effort required to succeed and value learning the right way over the easy way. Learning experiences are challenging, authentic and engaging and involve practical ‘hands-on’ activities and real world experiences whenever practicable. Problem solving and “being brave” is promoted, along with thinking skills, to enhance student learning. With the support of their teachers, our students identify their learning needs and set achievable goals. The students have many opportunities to pursue their own interests and strengths. We assess our students to individually target their point of need according to the school’s Assessment and Reporting schedule. At Lysterfield Primary School, we aim to develop students who are curious about the world around them and both confident and creative in the application of their knowledge and skills. In a rapidly evolving world, we view this as pivotal to their future success. To achieve this, the school provides sequential and targeted teaching and learning programs. These programs ensure that our students are highly literate and numerate critical thinkers and problem solvers equipped to handle any challenge. At LPS we are committed to offering a thorough, sequential and comprehensive curriculum for our students based on the Victorian Curriculum. The Victorian Curriculum is designed as a continuum of learning that is specifically focussed on individual student learning growth. All students have access to a curriculum program that comprehensively addresses the standards and capabilities of the Victorian Curriculum at their developmental level. At LPS, our commitment to key learning areas includes daily explicit instruction and application in English and Mathematics. We place a strong emphasis on literacy and numeracy, as we believe this is an essential pathway to success. Inquiry based learning stems from the constructivist theory, which seeks to ensure students are actively involved in their own learning. The urge to inquire activates thinking on many levels; when we seek to make sense of the world around us, we involve ourselves in the learning process. Children learn best when they ask questions, investigate solutions, create new knowledge, discuss their discoveries and solutions and reflect on new learning. With this as our premise, staff design Inquiry units based on the ‘Know and Understand, Be, Do’ (KUBD) construct. We ensure that we provide opportunities for students to develop their Knowledge & Understanding of key concepts, build on their capabilities and skills (Do) and heighten and develop an awareness of their own and other’s attitudes, motivations and dispositions when engaging with these learning designs. Our students complete four inquiry units per year that address the science and humanities learning areas of the curriculum. These include Science, History, Geography, Civics & Citizenship, and Economics & Business. We also incorporate the capabilities of the Victorian Curriculum into the design of these learning opportunities: Critical and Creative Thinking, Ethical, Intercultural and Personal and Social. These units are implemented across the whole school, using a two-year cycle, and culminate each term in a “Celebration of Learning” day at the conclusion of each term. Lysterfield Primary School teaches English in line with the Victorian Curriculum F-10. The English curriculum is divided into 3 modes – Reading, Writing and Speaking and Listening, as well as 3 strands – Language, Literature and Literacy. We place a high priority on English and students are given many opportunities to learn and apply their skills in a variety of contexts. Teaching is explicit and regular feedback is provided to ensure that goals are reached and maintained. Students are encouraged to read a wide variety of texts, in different contexts, and for different purposes. Our daily reading sessions are taught using a workshop approach, whereby teachers explicitly teach a new skill or strategy, students practice this with others and finally they work on it independently. We use the CAFÉ reading strategies to teach reading. Comprehension, Accuracy, Fluency and Expanding Vocabulary are the foci of each reading lesson as well as students’ individual reading goals. Through explicit teaching, these strategies are modelled, practised and internalised until they are demonstrated independently. Each class has their own classroom library, which contains books of interest to the students. Fiction and non-fiction books, recipes and poems, class stories and magazines are available for students to choose. Weekly visits to the school library complement the choices available to students and provide opportunity to listen to teachers and others read. Writing encompasses handwriting, grammar, spelling and text structure, whilst using different genres. In the junior grades, handwriting includes developing fine motor coordination and hand muscle strength as well as correct letter formation. In the middle years, students learn to write in joined handwriting and to use a pen. We implement a whole-school approach to spelling by using the SMART spelling program. Students learn to use the sounds of letters as well as letter patterns, syllables, spelling rules and meaning to spell unknown words. Writing is practised throughout the curriculum, but a focus on specific text structures is taught explicitly at each level. Within this structure, attention is given to audience, content, word choice and author’s voice. Publishing finished pieces of work gives the students purpose for their writing. Students have many and varied opportunities to speak and listen to others throughout each day. Class discussions, collaborative learning opportunities, reading aloud and presenting information, offer students the chance to communicate for different purposes. From prepared ‘Chat Time’ in the Junior School to the Middle School weekly debates, where they prepare notes for their opinion at home and attempt to sway others to their point of view, and on to ‘Speech Club’ in the Senior School, students learn to prepare and present to an audience and to listen with intent. Lysterfield Primary School teaches Mathematics in line with the Victorian Curriculum F-10. The curriculum is comprised of three strands – Number & Algebra, Measurement & Geometry, and Statistics & Probability, as well as four proficiencies – Understanding, Fluency, Reasoning and Problem Solving. Students have every opportunity to learn and develop their potential, and are committed to explicitly teaching Mathematics every day. Mathematics lessons at LPS follow a structure that includes routines or ‘Hooks’ that promote whole class mathematical discussion and reasoning and encourages students to see mathematics as a flexible subject. Students are also involved in explicit teaching of mathematical skills, concepts and strategies. Number & Algebra is a key focus each week and students are taught skills and strategies at their point of need. Students work in small groups either with the teacher learning new concepts, playing games that promote fluency of basic facts, or completing online tasks to practice and improve their skills. Students also regularly engage in open-ended, problem-solving lessons. These rich tasks with a low floor and high ceiling, allow students to access the problem at their point of need. Strategies to develop problem-solving skills are explicitly taught and students work collaboratively to solve complex problems that require novel and critical thinking. Mathematics learning is enhanced through Mathematical Investigations. The investigations allow students to see the use of Mathematics in real life, apply their skills in realistic and authentic ways and learn the organisational skills of planning and maintaining an ongoing project. Mathematics is one of the key competencies of the future workforce with the rise of STEM jobs, and the greater need for problem solving and critical thinking in our ever changing and uncertain future. LPS is committed to ensuring our students have a deep conceptual understanding of Mathematics, as well as the transferable skills of Problem Solving and Critical Thinking to support them in their future endeavours. Lysterfield Primary School understands how the world is evolving and how the continual advances in technology are changing the way students learn, connect and interact every day. Skills developed by students through STEM provide them with the foundation to succeed at school and beyond. Our teaching and learning sequences for science are constructed around the Victorian Curriculum. Science includes biological, chemical, earth and space and physical science. We teach science at Lysterfield through our termly inquiries that alternate on a yearly basis. Just like our students, we consider ourselves lifelong learners and strive for continual development in our own teaching and learning. Lysterfield Primary School is in partnership with the CSIRO, through the Scientist in Schools program, which provides a scientist with whom we work alongside to create engaging learning experiences for our students.